Files from medical imaging devices like MRI’s, ultrasound, PET, CT scans, etc come as a collection of .DCM files which will not open on their own through just any image or video application. No big deal, because I came across some pretty amazing software for Mac OS X and iOS called OsiriX that will render these DICOM files as a fully controllable and playable 3D movie. 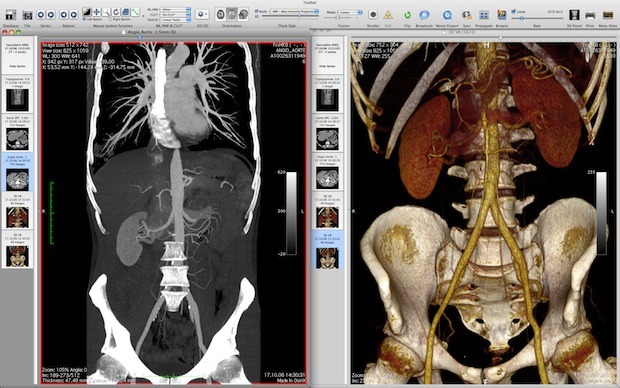 Not only can OsiriX view the DICOM files, but you can then export them either as static images in a variety of friendly formats like JPG and TIFF or even as QuickTime movies. In my case, these DICOM files came from an MRI. I’m just a curious patient, not a medical professional, but after paying the equivalent of a brand new midrange MacBook Pro to get an MRI, I wanted to be able to view the resulting MRI DICOM images on my Mac when I got home. OsiriX delivered in a far more impressive manner than I expected, it is one of the most interesting applications I’ve ever used. Considering how expensive everything else is in the American health care world, I was shocked to find out that it’s offered for free for Mac OS X and just $30 for iOS. My doctor happened to be using an older Windows tablet – remember those? – but I can see OsiriX and iPads taking the healthcare world by storm in the very near future. In fact, this combination is already in use at some hospitals around the world, and you can watch a video below of surgeons using an iPad with MRI images within OsiriX during an operation. And no, this has no relation to the teenager selling his kidney to buy an iPad 2. You needed an MRI? Hope it wasn’t serious! This read like a commercial for the software. I wonder. Dave, this is open source. If you want support, or you want it FDA-cleared, then you pay. this program is non-functional in 10.6 & is too bloated. Use xnview to view & convert to JPEG files, much easier for X-ray scans. try out this free viewer that runs in your web browser. no downloads necessary! MRI files show up with ? on each image that is .dcm. Not a very useful program. I just downloaded the program. It’s free, works exactly as described, quickly, cleanly and easily. While I agree the article reads like an advertisement, I’ve been frustrated that my doctors’ offices give me CDs that only work in a Microsoft environment. OsiriX gave me access to these files. I’m very pleased. Thank you for the article. The app is free to read DICOM medical images, if you think someone writing about something being FREE is an ad then wow you are an interesting person, must be a riot at parties. Meanwhile, your MRI probably cost $2000+ if you’re part of the USA for-profit health industry. 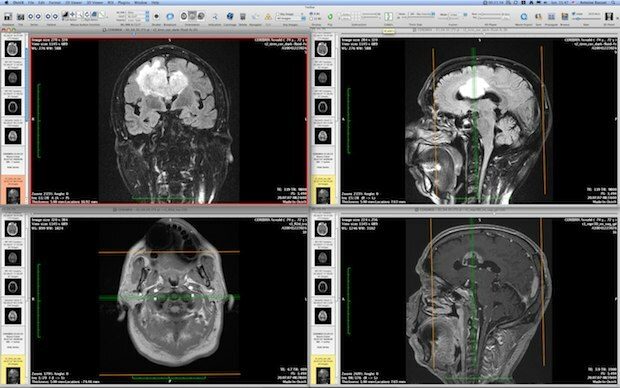 I would like to announce the Miele-LXIV project, a 100% DICOM standard compliant image viewer for macOS. The software is 100% free, the License is GPLv3.0. The Software has been localized for English, German, French, Italian, Spanish, Chinese and Japanese. The osiris website wouldn’t even email the download link to me for the lite version as indicated on their site. This whole situation is incredibly lame for a patient. $699 to buy an image viewer? Are you serious? Shame on Osiris for proposing such a thing and shame on the doctor’s office for going along with such a sham. 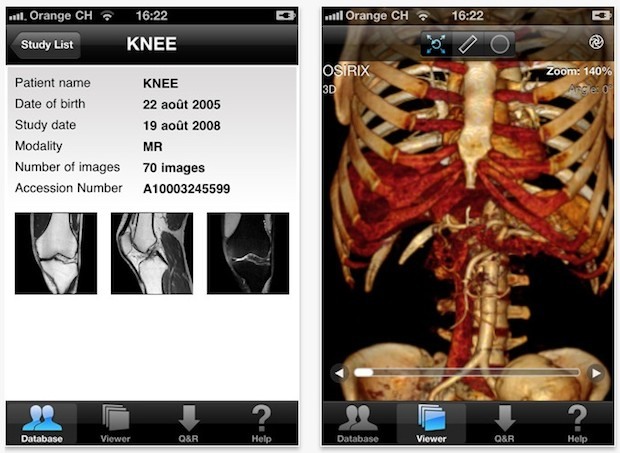 Click on the “Get download link for OsiriX Lite” button and you can run the free version. A lot of discs from the doctors office also include a simple viewer for MRI and CT images too. Followed the provided link to the OsiriX web site. All I had to do was register and they sent me a link to download the free “Lite” version. Downloaded, installed and runs fine on OS X 10.12.5. Actually runs much better and has more features than the Windows only Java application on the DVD. i just used it to look up ultrasound pictures and it worked fine for my old macbook OS X el captian! thanks so much! Program keeps crashing but that’s probably my old computer. Got to see the images and that what I wanted it for!